Type: These special patterns are hand painted in China. Several different techniques are used, resulting in unique designs at affordable prices. 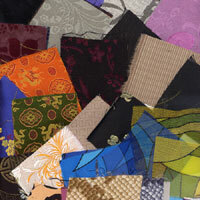 14 bundles of fabrics in all colors and patterns.